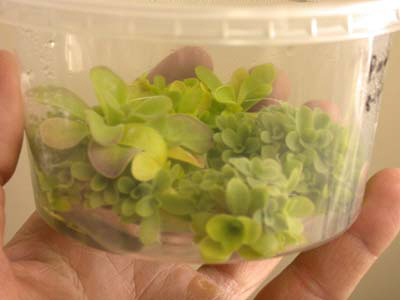 I put the technology of tissue culture to best use with Pinguicula by raising seedlings to a very large size in a small amount of time (fig. 3-5). I first realized how much time could be saved when I was still a student at California State University of Fullerton. Leo Song asked me to germinate some hybrid seed for him in vitro. 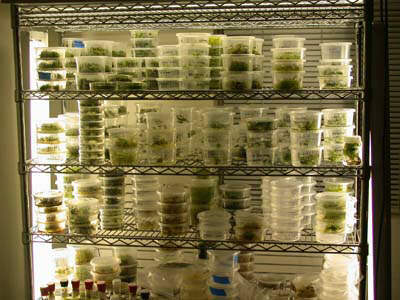 The seedlings were grown to a fair size in vitro and then planted out. 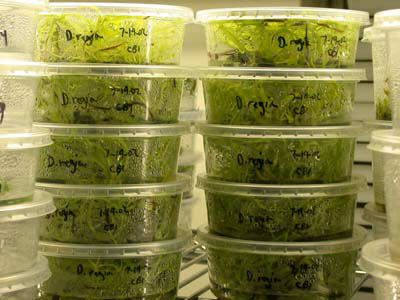 I collected seed from these same plants only six months after I put them in vitro! 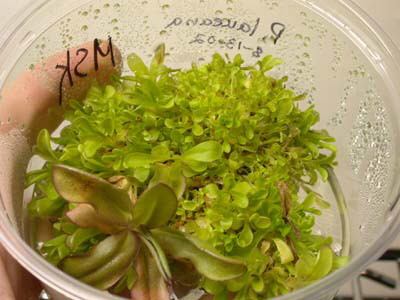 The latest similar experience was with some hybrid seed of P. gigantea X P. hemiepiphitica. 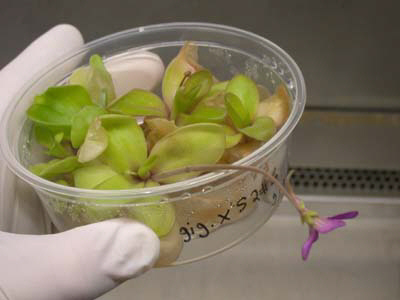 After only four and a half months (138 days) in vitro I had plants flowering in the containers (fig. 6). I unfortunately don’t have these same results with every specimen, but I do regularly have high success in germinating fresh seed and growing the plants close to adult size in less than 6 months. 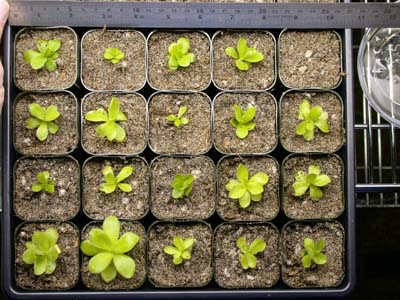 I typically take seedlings out of their containers after 4 months because the container lids are ready to pop off (fig. 7). 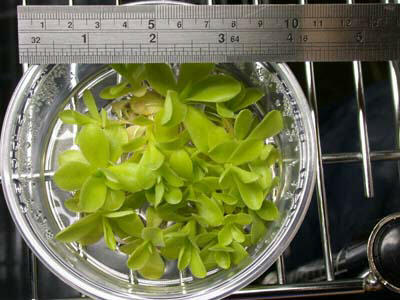 Plant multiplication is the most common use for the technology. Winter leaves are easy explants. 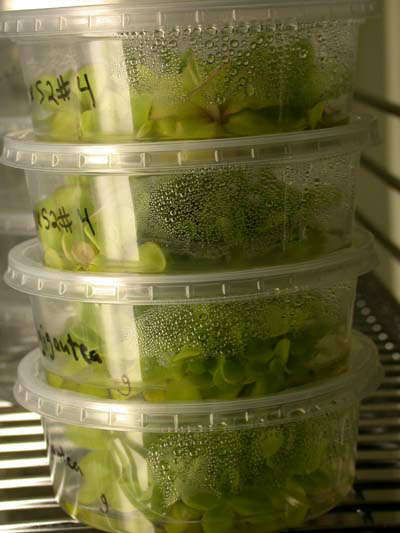 I can easily say that I have many more Pinguicula in tissue culture containers than in my greenhouse (fig. 1). I have been able to multiply newly acquired species thus increasing my chances of not loosing them (fig 8-10). My problem is not knowing when to stop dividing the cultures. For example, one year I had 20 containers of P. esseriana. It was impossible to count how many plants were in each container because they were small plants and they completely filled the containers. 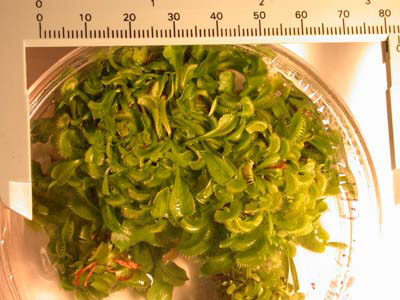 How many plants of Drosera regia could one possibly need (fig. 11)? In my experience, Mexican Pinguicula are the easiest to take out of the humid sterile containers and pot into “soil.” Just treat the material as you would leaf cuttings. There are many great resources for learning this technique. I would stress a few steps that I feel are very important and often overlooked. Read the whole book! 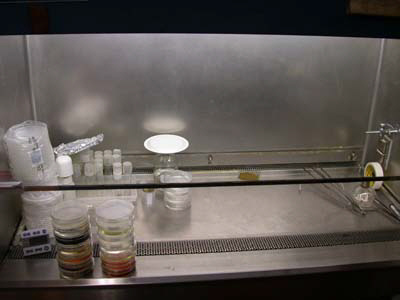 You can have success without an expensive flow hood, but get yourself one if you see that you will be doing this for years to come (fig. 2). Use Tween20 or another similar detergent along with the sterilization solution. Make a lot of sterile rinse water. Rinse your seeds or explants three times! Rinse once for one minute, rinse again for 10 minutes, and then again for a longer period. Let your seeds sit overnight in the rinse, they like it. Don’t put too much material (seeds, explants, paper) in the rinse. Good sterile technique comes with practice and attitude. If you are not having success, give yourself a break and get some material already in vitro to practice with. Nothing is worse than waiting for seeds to germinate that never do or watching your precious explants go up in a cloud of spores time after time. If you did well in your chemistry labs, you should know everything you need for a safe experience. Good luck and don’t forget to read the whole book and rinse 3X.